When a business is struggling financially, the weight of responsibility to solve the problem falls on the business owners and Directors. Cranfield Business Recovery are a team of qualified Insolvency Practitioners able to offer financial and legal advice, including corporate insolvency and business recovery options to business owners in the Midlands. 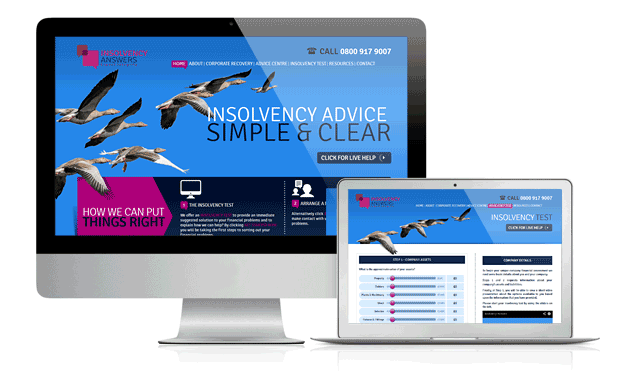 We were very pleased to work with Cranfield to design and build a new website for their new venture, Insolvency Answers. Insolvency Answers was created to bring insolvency resources and guidance to business owners and directors facing the challenge of corporate insolvency, or business recovery. The design concept for the site was to reflect a journey to recovery, and a moving away from past problems toward a brighter future, rather than the problems themselves as with competitor’s websites. As well as this unique look online facilities were developed for the site to assist the visitor in immediately beginning their journey in the form of live chat and an online assessment facility. Within minutes Insolvency Answers online assessment facility is designed to give site visitors clear, professional, and confidential advice based around the basic information they provide, suggesting a solution before having to speak to anyone. HeadRed worked hard to give Insolvency Answers a fresh and unique look within the insolvency industry; with the hope that it will give business owners and directors the platform they need to begin their steps toward recovery. Please visit the Insolvency Answers website and tell us what you think!